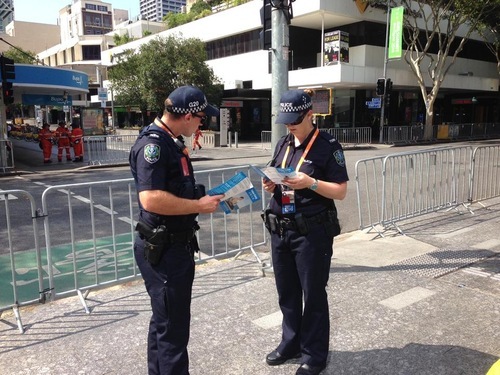 Impressed with Falun Dafa’s (also known as Falun Gong) peaceful protest, police officers gave their support and protection during the G20 Leaders’ Summit held in Brisbane, Australia. The officers came to understand the kindhearted nature of practitioners through talking with them and reading their pamphlets. 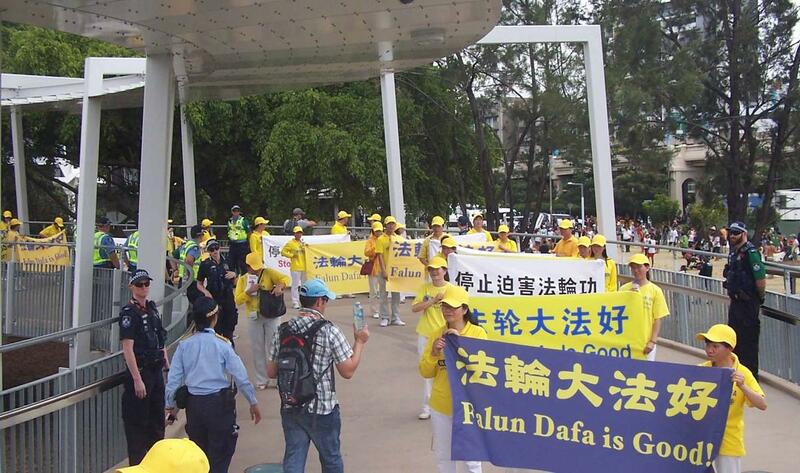 They asked for a Falun Dafa banner to put up in their office after the activities concluded. The 2014 G20 Leaders’ Summit was held on November 15 and 16 in Brisbane, Queensland. 6,000 additional police officers from other states of Australia and New Zealand were dispatched, making for “the biggest peacetime police operation in Australian history,” according to Queensland Deputy Commissioner Rose Barnett. 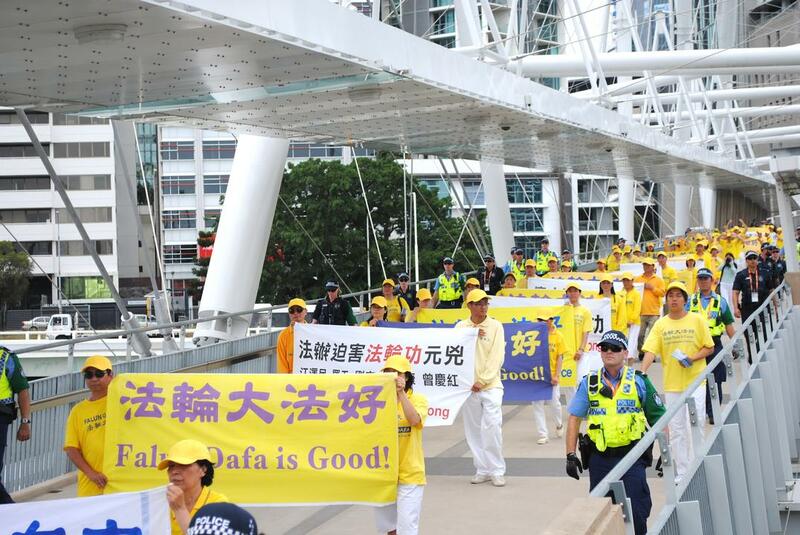 Nearby Falun Dafa practitioners’ banner display at King George Square, a police officer who had been stationed there the whole day commented, “I have rarely seen a demonstration group so peaceful as yours.” Upon leaving he shook hands with practitioners and thanked them for their extraordinary demeanor. The temperature reached a near-record high of 40 degrees Celsius in Brisbane on Sunday. Police officers delivered water to practitioners and reminded them to stay hydrated. The Chinese consulate had instigated many pro-communist groups to harass practitioners throughout the two days, but all of these attempts were stopped by police. Several police officers approached and spoke with the Chinese student leader, who argued with the officers. The officers stated that the Falun Dafa Association had been granted a permit for that spot several weeks prior. Therefore, the students—who did not have a permit—were ordered to move on. “None of the students went close to the practitioners afterward.” Andress explained, “In fact, a few days ago we learned that the Chinese consulate had been recruiting Chinese university students or Chinese employees from Chinese-owned companies, so that they would come during these two days to interfere with us.” The police were very concerned when he told them this. The Chinese delegates intentionally changed routes and took a back road to the summit after catching a glimpse of Falun Dafa’s anti-persecution banners. 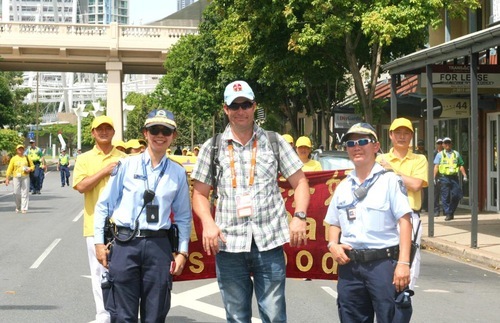 The police officers then helped practitioners re-position their banners in more visible spots, so that the Chinese delegates had to see them. William Luo, also from the Queensland Falun Dafa Association, learned through interacting with the police officers that they’re normally under a lot of pressure and sometimes have to deal with criminals. “When staying with us, however, the officers not only had no pressure, but were also able to enjoy Falun Dafa’s tranquil music,” commented Luo. Many of the officers had their photos taken with practitioners during the march, and had a group photo with practitioners after the march. Luo recalls when he first applied for a marching permit several years ago and was initially denied. “The officer-in-charge said he was not familiar with our group. 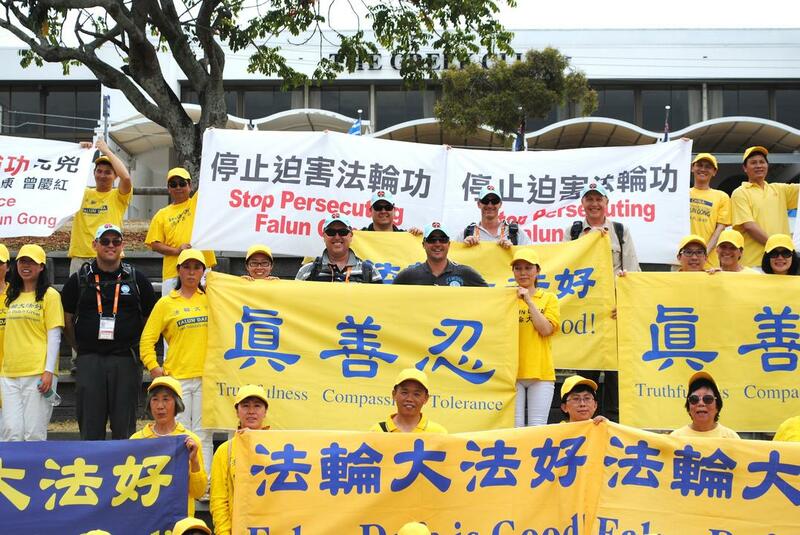 So we told him about Falun Gong and he visited the Minghui website, where he saw Falun Dafa’s foundational principles of Truthfulness-Compassion-Forbearance displayed. He then decided to approve our permit and continued to check up on us to see if we actually followed the principles—and we did,” he said.